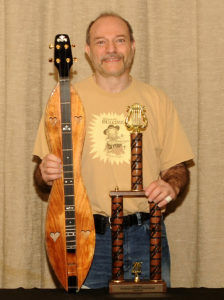 Mark was named 2016 National Dulcimer champion at the annual Winfield competition in Kansas. Mark Gilston has been performing traditional folk music for over forty-five years. His vast repertoire encompasses songs and instrumentals from North America and most of Europe, particularly the British Isles, Scandinavia, and the Balkans. His performances are laced with humor and a wide base of eclectic knowledge. Mark, an award-winning mountain dulcimer player (National Dulcimer Champion (2016), Deep South Dulcimer Champion (2016), Texas Mountain Dulcimer Champion (2015) and Oklahoma Mountain Dulcimer Champion (2004), also plays concertina, guitar, banjo, Bulgarian bagpipes, pennywhistle, ocarina, tambura, and others. He has given concerts at numerous colleges, clubs and coffee houses throughout the United States as well as England and Canada, and has been a featured performer and workshop leader for various folk music societies including the New York Pinewoods Folk Music Club and the Folk Song Society of Greater Washington as well as groups abroad. He is currently performing music and living in Austin, Texas.